AMD Volcanic Islands family is now official with the introduction of the latest GCN based Radeon R9 and Radeon R7 graphic cards aiming the budget friendly price points of $89 – $299 US. 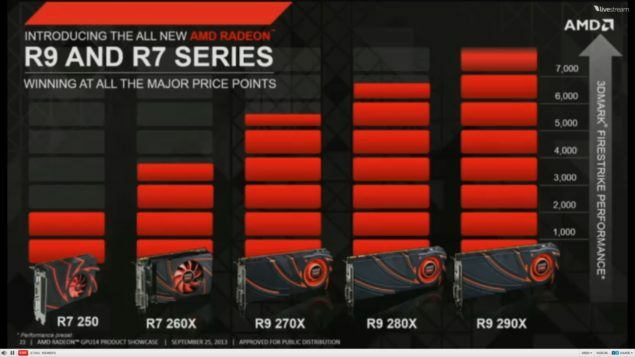 The prices at which AMD has intro’d their latest GCN based Volcanic Islands family is nothing short of amazing with the $89 R7-250 coming faster than the Radeon HD 7770 while the Radeon R7-280X gives you a full blown Tahiti architecture at only $299. 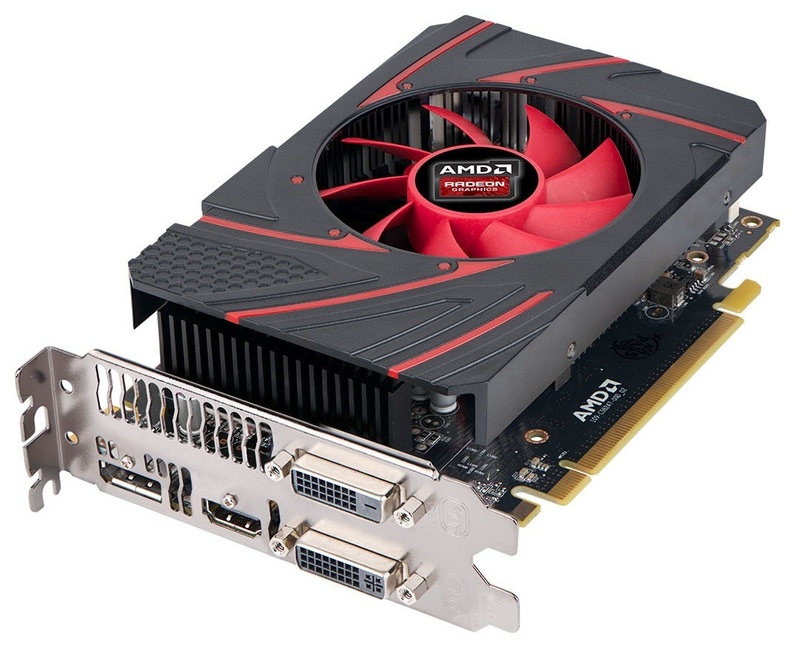 The AMD Radeon R9 280X is based on the Tahiti XT architecture featuring 2048 Stream processors and scores 6000 points in 3DMark Firestrike performance mode. The Radeon R9 290X would be available for $299 in the next couple of weeks and is remarkable that Tahiti is now available for such a low price while it was the flagship GPU of the last generation Radeon Family. 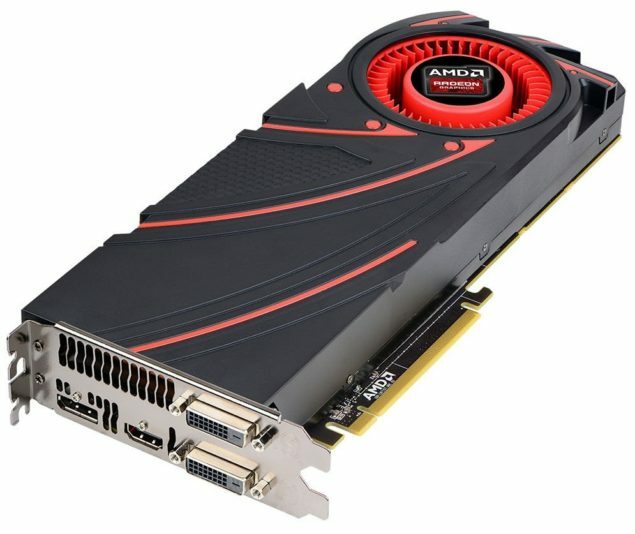 The AMD Radeon R9 270X is based on the latest Curacao XT GPU while its younger brother, the R9 270 is based on the Curacao Pro chip. The Curacao Pro ended up faster than the Radeon HD 7870 in a previous performance overview so its easy to say that the Curacao XT based R9 270X would be much faster and trade blows with the Radeon HD 7950. 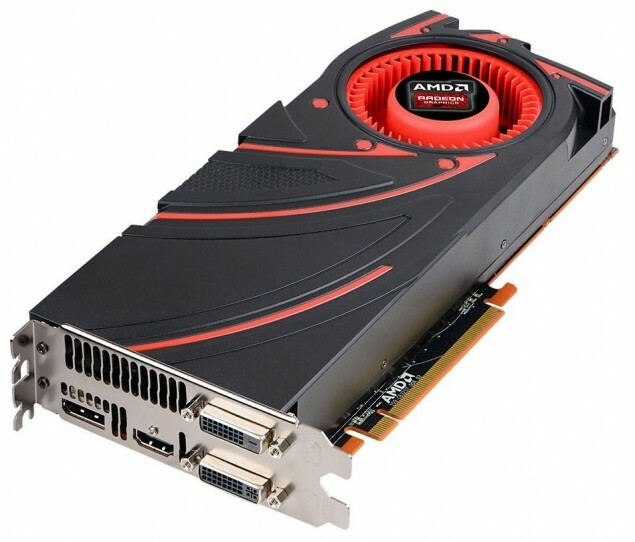 The GPU would feature 2 GB GDDR5 memory and a price of $199 while the Curacao Pro model would be available for $179 US. 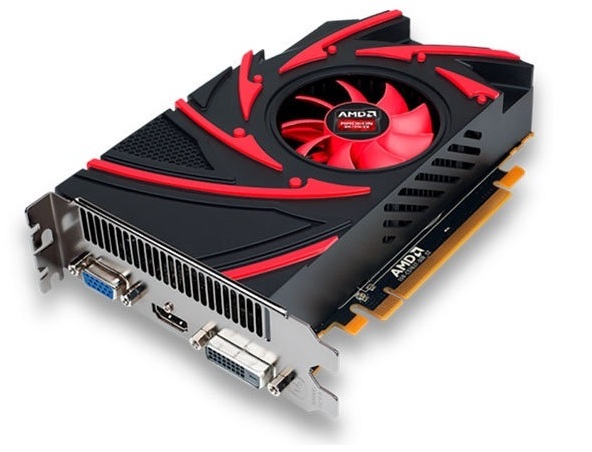 The AMD Radeon R7 260X is a single variant that is based upon the Bonaire XTX chip which is a faster version of the Bonaire core that was feature on the Radeon HD 7790. The GPU has a performance score of around 4000 marks in Firestrike in performance mode and would be available in 2 GB models for $139 US at launch. The last up in the AMD Volcanic Islands family are the Oland XT and Oland Pro based Radeon R7 250 with upto 2 GB GDDR5 memory and the Radeon R7 240 with upto 1 GB DDR3 memory. The Oland XT Radeon R7 250 would cost $89 US at launch while the Radeon R7 240 would cost $59 at launch. We will be grabbing specifications regarding these GPUs in a few minutes so stay tuned for the updated details. 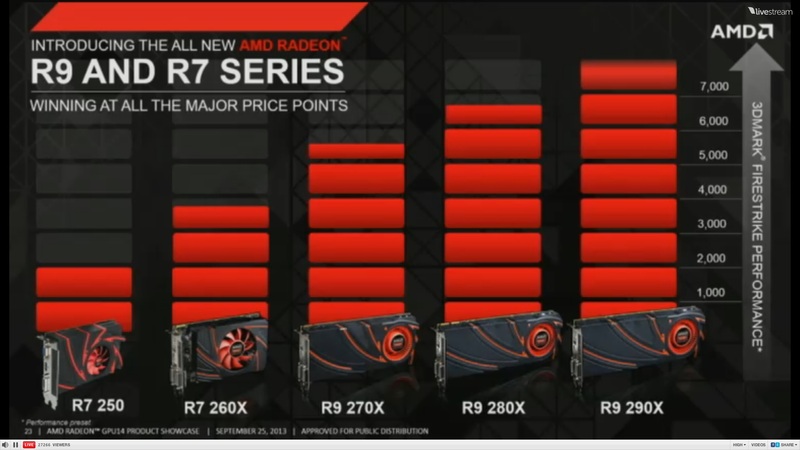 Till then enjoy the amazing prices of the AMD Volcanic Island GPUs. 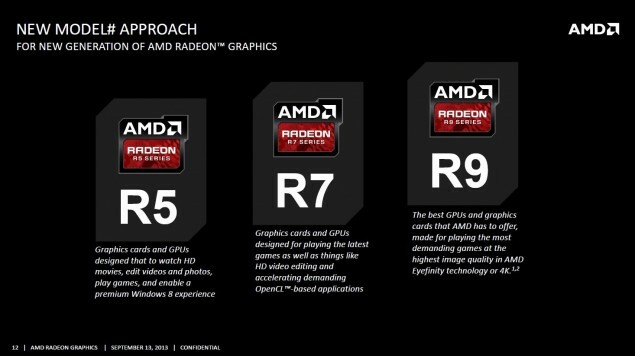 Press Release – AMD today unveiled the AMD Radeon™ R9 290X, R9 290, R9 280X, R9 270X, R7 260X and R7 250 graphics cards, AMD’s first GPUs in a new era of gaming defined by UltraHD displays, renewed vigor in game engine development, and a new generation of gamers that expect a more immersive entertainment experience. AMD also introduced the world to Mantle and AMD TrueAudio technology, the latest innovations that redefine the GPU by enabling both gamers and game developers with unprecedented audio and performance enhancements for compatible games12. The award-winning Graphics Core Next (GCN) architecture in the AMD Radeon R9 and R7 Series graphics cards continues to serve as a driving force behind the Unified Gaming Strategy, AMD’s approach to providing a consistent gaming experience on the PC, in the living room or over the cloud — all powered by AMD Radeon graphics found in AMD graphics cards and accelerated processing units (APUs). The four pillars of the Unified Gaming Strategy — console, cloud, content and client — come together with the introduction of Mantle. With Mantle, games like DICE’s “Battlefield 4” will be empowered with the ability to speak the native language of the Graphics Core Next architecture, presenting a deeper level of hardware optimization no other graphics card manufacturer can match. Mantle also assists game developers in bringing games to life on multiple platforms by leveraging the commonalities between GCN-powered PCs and consoles for a simple game development process. With the introduction of Mantle, AMD solidifies its position as the leading provider of fast and efficient game development platforms. Mantle will be detailed further at the AMD Developer Summit, APU13, taking place Nov. 11-13 in San Jose, Calif.
AMD TrueAudio technology marks a new frontier in realism for PC gamers. AMD TrueAudio technology empowers game developers with a programmable audio pipeline on the GPU, inviting them to put their unique artistic fingerprint on in-game audio in the same way that the programmable graphics pipeline brought unfettered artistic vision to PC graphics. Enabled games can feature more realistic environmental dynamics, a richer tapestry of sound effects, breathtaking directional audio and more. The arrival of the next-generation AMD Radeon graphics cards also marks a new chapter in AMD’s historic support for stunning display configurations. AMD Radeon R9 and R7 Series graphics cards are made for gaming on UltraHD (3840×2160) displays, including support for non-tiled 2160p60 displays with a future AMD Catalyst™ driver release. In addition, gamers more accustomed to AMD Eyefinity multi-display technology will be freed to use virtually any combination of display outputs when connecting matching monitors to the DVI or HDMI® outputs on their system. 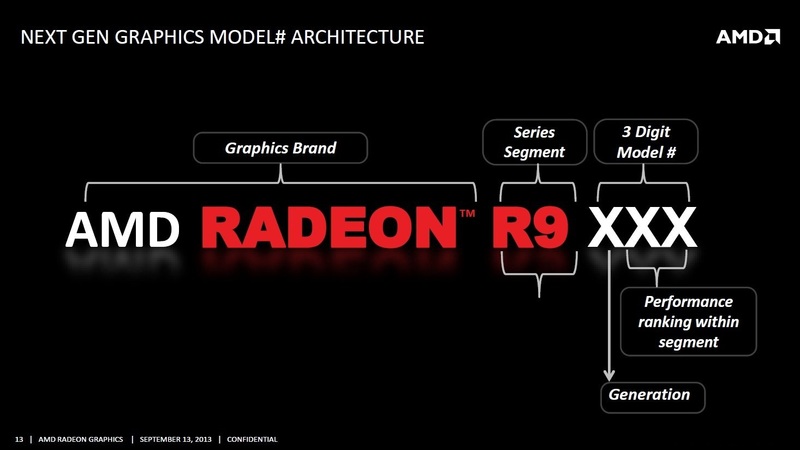 AMD Radeon R9 and R7 Series graphics cards will be available for purchase in the near future.